From left to right: Nayer Azam (Store Owner and Operator – Juice Bar), Mohammed Kharfan (Store Owner and Investor), Eli Swirsky (Torgan Group President), Albert Fialkow (Store Owner and Investor), Sarabjit Singh Mattu (Store Owner and Operator – Perfum Boutique) and Ramesh Prajuli (Store Owner and Operator – Himalayan Arts and Craft) Photo credit: supplied by Bud Moore Photography through New Horizon Mall. 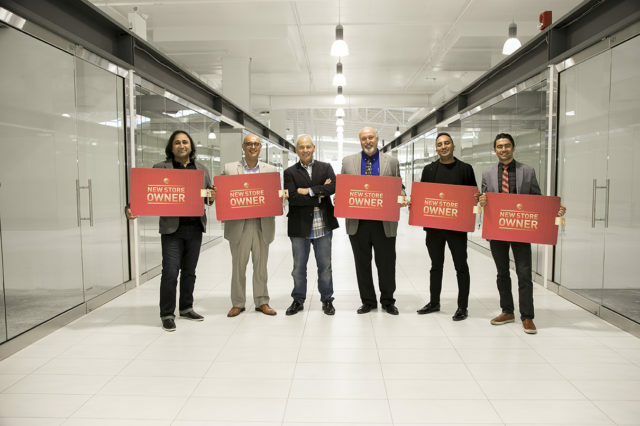 There’s an exciting and unique addition to Calgary’s vibrant and entrepreneurial retail landscape. The $200-million, 320,000-square-foot mall in Balzac, 20 minutes from downtown Calgary and directly across from CrossIron Mills, opened for business in early May and will soon feature more than 500 stores ranging in size from 285 to 855 square feet. New Horizon Mall is a southern Alberta retail first. Each store is purchased outright; some stores have been purchased by the retailers themselves and some are purchased by investors and leased out. A majority of the store spaces are privately owned by different investors who lease out the store space to individual retail tenants or directly to store owners. Torgan retains ownership of about 30 per cent of the space and the units are governed by a set of common bylaws, similar to a condo corporation, with yearly maintenance fees. The mall, which some are already calling “a small-business owner’s dream” is a sprawling, bright, modern “international bazaar,” featuring a food court with 26 restaurants and seating for 300 – serving up a variety of international cuisines and local specialties from dozens of national and independent owner-operated eateries. The mall also has an underground parkade and outside surface parking. In terms of the total number of actual stores, New Horizon is the largest mall in Calgary and second largest in Alberta, behind West Edmonton Mall. 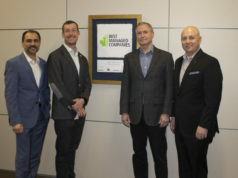 “A key aspect of the New Horizon Mall uniqueness is, unlike other malls which are occupied primarily by large corporations and chains, New Horizon Mall is a collection of small businesses, family enterprises and local entrepreneurs bringing their products and services to the Calgary region,” Swirsky says. He adds that New Horizon Mall may be the most culturally-diverse shopping destination in southern Alberta. Each retail space provides shoppers with international specialty products or services, including contemporary fashion, high-tech goods and exotic everyday items. He acknowledges that consumer trends and other factors impact retail and mall operations and emphasizes that the New Horizon Mall location, across from the booming CrossIron Mills, is a positive.